There’s plenty going on this Xmas and New Year on the running front so here’s a number of dates for your running club diary. The Cross Country and Border League series are well under way with record attendances which is brilliant as it puts us high up in the leagues. The next Border League is our own at Wigg Island organised by Vanessa and Adrian. The recce went well last Sunday, but car park and course marshals are still required so if you can help or know someone who can please contact Vanessa & Adrian (see below). Here’s a quick update one what’s coming up. The green events are Helsby Running Club counters and organised events, red extra Xmas events you may be interested in doing and blue English Athletics related events. Saturday 14th Dec Leadership in Running Fitness Course – Bolton – Chris BH, Jennie & Roy are attending this course, funded by Sport Cheshire. Wednesday 25th Dec Xmas Day parkrun 9:30, the parkruns have been so successful that Gareth & Co are even organising one on Xmas morning to work up at appetite for your turkey dinner! Thursday 26th Dec Goshawk Run 12:00, an informal 3 mile run from the Goshawk pub in Mouldsworth. Just turn up and run. Its also the Race the Walls in Chester, but you probably need to pre-enter http://www.westcheshireac.co.uk/roadracing/RoundtheWalls . 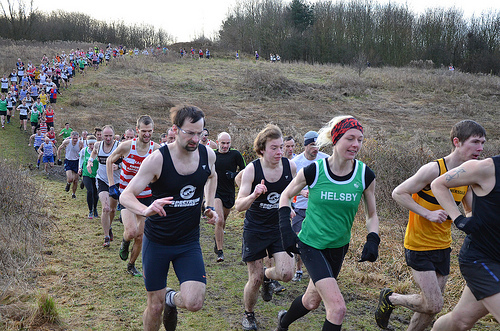 Saturday 4th Jan Cheshire Cross Country Championships – Birchwood – 1pm ladies, 2pm men, junior races from 11am. Show case XC of the year for runners & spectators! – Chance to see and run with Cheshire’s best and to try and qualify for a Cheshire vest and the Nationals, but don’t be put off its a good team day out for all levels of runners. Must be born in Cheshire or have resided for last 9 months, pre-entry, if you wish to run please let Jayne Joy jaynejoy@gmx.com know before 25th Dec.
Sunday 5th Jan Marathon Workshop in Stockport 9-1, if anyone wants to attend this free course organised by English Athletics, please let me know and I will check availability. See attached flier. Saturday 18th Jan Four Villages Set up Morning, 9am at the club. Again very important – Please see note below from Gareth. Saturday 19th Jan Essar Four Villages Half Marathon 11am, entries are now full. Whether you run or help on the day lets hope it’s a brilliant race day, proudly organised by Gareth and Helsby Running Club. Saturday 25th Jan Northern Cross Country Championships, Knowsley Safari Park, 2pm ladies 3pm men, juniors races from 11pm. Another good day out for runners & spectators! – Must be 1st claim for Helsby to be eligible, born in Cheshire or have resided for last 9 months, pre-entry, if you wish to run please let Jayne Joy jaynejoy@gmx.com know before 5th Jan.
Saturday 9th Feb Leadership in Running Fitness Course – Bolton – Mario, Gareth, Carol, Louise and Donna are attending this course funded by Sport Cheshire. As a result of the Leadership in Running Fitness Courses attended by many members, in the new year Chris & co hope to organise an extra training session (fartlek, endurance, hill reps etc), extra hands will be available to help Joe with his speed track sessions on a Monday and for Jane with her ever growing beginners groups. All good and positive news for running with Helsby Running Club in 2014! I have put together another google calendar with these extra events in, please try cutting and pasting this into the calendar. A happy Xmas and New Year when it comes and hope to see you at many of these events this Yuletide and into 2014!. Hopefully everyone has had an enjoyable Christmas, eating well and spending time with family, plus opening up presents to find that new pair of fantastic fell shoes! It’s been a busy period, envelopes now completed for the Helsby Half and still lots of races to keep us active over what is normally a restful period. It was a brilliant turnout for Robbie’s funeral, standing room only at Alvanley Church with lots of stories and familiar faces at the club afterwards. A sad day but I think his family can take lots of pride in knowing how popular Robbie was and how well he was thought of by so many people. Sunday 31st December was our Penultimate Northwest XC race at Stadt Moers, which I’d now say is my favourite XC course on the calendar. Undulating and winding and muddy in parts but all very runnable and the short distances to each curve and bend kept you on your toes chasing the people in front. Luckily(?) we couldn’t actually feel our toes after being asked to start the race in a very cold puddle! Fantastic course too for spectators and what strong support with Colin Bishop and Jane, Jenny’s parents, Steph and Mick, Wayne Percival and Mario and Joe all offering lots of encouragement to the Helsby contingent, importantly keeping us informed of how we were doing in each of our individual races. Great turnout for Helsby, eight men and the commanding ladies team of six, who performed spectacularly once again. In total 102 men ran and 39 women. Helsby had three ladies in the top six to secure the team prize on the day, and by all accounts means they have maximum points and should hold the trophy for one more year. I think all who watched the race will know how well everyone ran and with nearly a full house for sandwiches and drinks (and awesome mince pies!!) afterwards the enthusiasm was clear for everyone. This already bodes well for next season in this league. If you want full results they are available from Steve Saunders website, who had to drive home and miss his own race as he’d forgotten the runners envelopes. Sterling effort for doing that Steve. For added affect we have some great photography from Mick Charman and Dave Pinnington. Links below if you like colour with your weekly round-up. Full results above but well done to John for 817th in 52.44 and with over a thousand runners in that one. Earlier in the week on Boxing day there were two other races that I know of, the Goshawk run and the Round the Walls. I’ve had no information or results from Goshawk so if anyone knows of any please forward and I’ll update the blog. Round the Walls was unable to utilise the flooded racecourse so a shortened race of just over 3 miles with 425 runners in total, with quite a few in fancy dress. A little mulled wine and mince pie help to make the effort worthwhile. I will now start compiling a list of races and once the Helsby half is out the way we will begin looking at the road and fell counters for 2013 so start having a think and letting me know of your favourite races as we do like to add in races that people can recommend. Hope I’ve not missed anything and I have a feeling 2013 will be another great year with Helsby still attracting new runners and building a strong foundation for future success. If anyone is interested there is a Charity run on New Years Day starting from Thornton Hough village at 11.30 and a straight run to Willaston. It’s about 3 and a bit miles, fairly low key but a good burn-out if you fancy it. I normally park at the Pollards Inn CH64 2TU at about 10.45 and run to Thornton Hough as a warm up taking £5 for the charity bucket with me. The race will finish at the Pollards and there is a charity raffle and prize giving a short time after. Everyone obviously welcome. Alternatively you can park at Thornton Hough then run back as your warm-down. A map of the run here.